Kleptoparasitism is a tactic used to acquire food opportunistically and has been shown to provide several benefits, including greater food intake rate and the acquisition of items not normally available during self-foraging. Host individuals may differ in their ability to defend themselves against kleptoparasitic attacks and therefore identifying those host individuals that are particularly vulnerable to attack could both provide energetic benefits and increase the efficiency of kleptoparasitism as a foraging strategy. Here, we show that the kleptoparasitic fork-tailed drongo (Dicrurus adsimilis) specifically targets juveniles when following groups of cooperatively breeding pied babblers (Turdoides bicolor). Drongos give alarm calls upon sighting a predator, thus providing extra predator vigilance to foraging pied babblers. However, drongos also use alarm calls to steal food items. During kleptoparasitic attacks, drongos give false alarm calls and then swoop down to steal food items dropped by alarmed babblers. Juvenile pied babblers are particularly vulnerable to attack because they (a) spend a longer period handling prey items prior to consumption and (b) respond to alarm calls primarily by immediately moving to cover, in contrast to adults who respond by looking up and visually scanning the surrounding area. 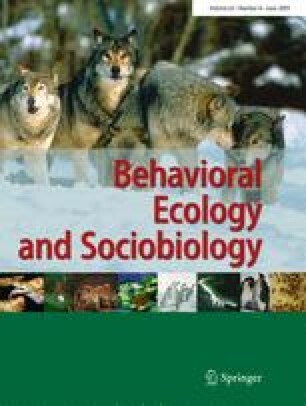 Drongos attack juvenile babblers significantly more often than adults, with attacks on juveniles more likely to result in the successful procurement of a food item. This patterns of attack suggests that drongos are able to differentiate between individuals of different age when targeting pied babblers, thus increasing the efficiency of kleptoparasitism as a foraging strategy. We thank the Northern Cape Conservation Authority for research permits. The Kuruman Reserve Trust, Mr. and Mrs. H Kotze and Mr. and Mrs. de Bruin kindly allowed us access to their land in the southern Kalahari. We thank all researchers at the Kuruman River Reserve for support and encouragement over the duration of our study and our fellow babbler and drongo researchers Nichola Raihani, Martha Nelson-Flower, Andrew Radford and Tom Flower for help and advice during data collection. We thank two anonymous reviewers for useful comments that greatly improved the manuscript. Special thanks to members of the Percy Fitzpatrick Institute for their continual support and advice. This research was approved by the Ethics Committee, Department of Zoology, University of Cape Town (AEC no. 2006/V15/AR). Funding was kindly provided by the DST/NRF Centre of Excellence at the Percy Fitzpatrick Institute, University of Cape Town.